Jupiter's migration across the early solar system may have cleared the way for the oddball arrangement of planets we see in our solar system today, scientists say. This view of Jupiter was captured by NASA's Cassini spacecraft in December 2000. Jupiter may have acted like a giant wrecking ball in the newborn solar system, roaming in to destroy an early generation of inner planets before retreating to its current orbit, researchers say. This Jupiter finding could help explain why the solar system is so different from the hundreds of other planetary systems that astronomers have recently discovered, and that life as it is known on Earth might be rarer than previously thought, the scientists added. These findings revealed that our solar system is very unusual. The typical planetary system is made up of a few super-Earths — rocky planets up to 10 times the mass of Earth — orbiting much closer to their stars than Mercury does the sun. These super-Earths are usually not only rich in rock, but also in so-called volatile materials that easily vaporize when heated. This means that super-Earths "tend to have very thick and massive atmospheres with pressures that exceed that of the Earth by factors of hundreds, if not thousands," lead study author Konstantin Batygin, a planetary scientist at the California Institute of Technology in Pasadena, told Space.com. In comparison, "the atmospheres of our terrestrial planets are exceptionally thin." Moreover, planetary systems that possess giant planets similar to Jupiter and Saturn typically have them much closer to their stars than in the solar system. Giant worlds known as hot Jupiters, whose orbits are only about one-tenth of the distance from Mercury to the sun, are some of the alien worlds that scientists have seen most often. "Our solar system is looking increasingly like an oddball," study co-author Gregory Laughlin, an astronomer at the University of California, Santa Cruz, said in a statement. Now Batygin and Laughlin find that Jupiter's migrations toward and away from the sun might explain why the solar system is an anomaly. In the early solar system, the sun was surrounded by a dense disk of gas and dust. This suggests that any inner rocky planets forming might have eventually become super-Earths such as many of the exoplanets that astronomers have seen around other stars. However, as Jupiter moved inward, its gravitational pull would have slung these nascent inner worlds into close-knit, overlapping orbits. This would have set off a series of collisions that smashed these newborn worlds into pieces. "It's the same thing we worry about if satellites were to be destroyed in low-Earth orbit," Laughlin said in a statement. "Their fragments would start smashing into other satellites and you'd risk a chain reaction of collisions. Our work indicates that Jupiter would have created just such a collisional cascade in the inner solar system." The resulting debris would then mostly have spiraled into the sun. A second generation of inner planets would have formed later from the depleted material that was left behind. This would explain why Mercury, Venus, Earth and Mars are younger than the outer planets, and why they are both smaller and have much thinner atmospheres than inner worlds seen in other planetary systems. "The results imply that our terrestrial planets formed after Jupiter's early migration wiped the slate clean and set the stage for formation of gas-poor objects," Batygin said. "The fact that all of these characteristics of the solar system turn out to stem from the same process is exciting — it is as if the scattered pieces of the puzzle are finally falling together into a coherent picture." "This kind of theory, where first this happened and then that happened, is almost always wrong, so I was initially skeptical," Laughlin said in a statement. However, "there is a lot of evidence that supports the idea of Jupiter's inward and then outward migration. Our work looks at the consequences of that. Jupiter's 'Grand Tack' may well have been a 'Grand Attack' on the original inner solar system." 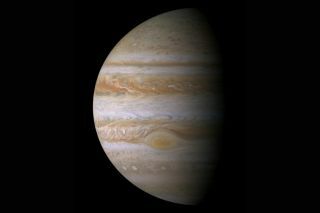 Jupiter-like planets are uncommon — "only about 10 percent of sunlike stars host them," Batygin said. This suggests "planetary systems like our own are also expected to be rare." In addition, only the formation of Saturn in the solar system pulled Jupiter back and allowed Mercury, Venus, Earth and Mars to form. One implication of these findings is that life as it is known on Earth might be rarer in the universe than previously thought. "Even with a relatively low-mass atmosphere, Venus is not hospitable to life as we know it. One can only imagine the kinds of extreme environments that are typical of extrasolar planets," Batygin said. "This is all to say that life that has evolved on Earth is not well suited to other planets. If solar system exploration and the search for exoplanets have taught us one thing, however, it is to never underestimate the physical diversity of planetary systems. Therefore, extrasolar life, where it exists, will differ substantially from our common definition and thrive in its own unique environment that is unlike anything we are used to." Another potential consequence of these findings is that "Jupiter-like planets and populations of super-Earths should be mutually exclusive, and as a rule will not be hosted by the same stars," Batygin said. NASA's Kepler space observatory's "Second Light" mission can scan the skies to begin testing this prediction, and NASA's planned Transiting Exoplanet Survey Satellite (TESS) can explore it further, Batygin said. Batygin and Laughlin detailed their findings online today (March 23) in the journal Proceedings of the National Academy of Sciences.